Teaching (and Learning!) 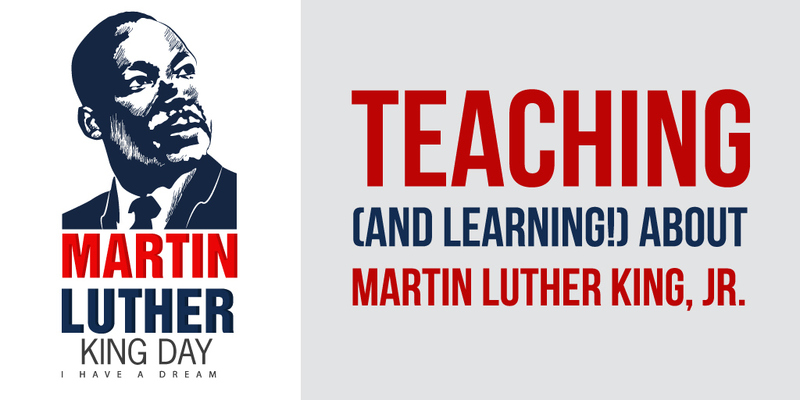 About Martin Luther King, Jr.
With Martin Luther King, Jr. Day occurring today, along with Black History Month approaching in February, now is a great time to teach your students about Dr. King. A leader in the civil rights movement, Dr. King inspired his followers with his nonviolent approach to activism. Most of us have heard his famous “I Have a Dream” speech, but there is so much more about Dr. King for you to teach your students. The Martin Luther King, Jr. Research and Education Institute: The Institute was founded at Stanford University in 2005 to provide a permanent base for the King Papers Project along with a range of other educational activities. Here, you’ll find a vast collection of inspiring resources and recommended readings, helping you incorporate Dr. King into your curriculum. National Geographic Kids: This simple, kid-friendly timeline of Dr. King’s life will give your students a basic understanding of who he was and why he is such an important figure in American history. National Education Association (NEA): The NEA has compiled a collection of lesson plans, activities, and other classroom resources to help you teach your students about Dr. King. The resources are arranged by grade level and available for students from kindergarten all the way up to high school. The New York Times: Published by The Learning Network, the paper’s teaching and learning blog, this post contains a selection of fascinating articles about Dr. King from over the years. MimioConnect™: This recently renovated MimioStudio lesson dives into the life of Dr. King and is perfect to share with your students as his birthday is celebrated this month. A video is used to introduce the lesson, and fact/opinion and ordering events are included as students explore his life. YouTube: A great introduction to Dr. King for younger kids, this short, visually appealing video tells the story of his life, including important events like the bus boycott and his March on Washington. Eyes on the Prize: Ideal for older students, this seven-part PBS documentary series details the civil rights movement throughout the years. All seven episodes are available for free, and each lasts about an hour. BrainPOP: This collection of resources is best suited for elementary students and includes a variety of videos and lesson plans focused on Dr. King. Scholastic: On Scholastic’s site, you’ll find biographies, plays, printables, and other resources about Dr. King. There are a variety of options for all grade levels from pre-K through the twelfth grade, so you’re sure to find something appropriate for your students here. National Park Service: This five-part guide with lesson plans is perfect for students from K–8 and dives into the rich history of the civil rights movement, with a focus on Dr. King’s efforts. We hope this list encourages you to add some engaging lessons about Dr. King to your curriculum this month! For additional lessons to inspire your class, check out our MimioConnect online educator community, where you'll find a wealth of teacher created and curated lessons and activities.